Aerial photography is definitely booming in recent years and you can use it to your advantage for your architectural photography. Aerial views can offer a new perspective and many clients appreciate it. Let’s talk about how to shoot aerials and what to look for once you’re in the air. The first step is to decide where you are going to shoot from. When it comes to aerial views, there are several options, including plane, helicopter, drone and rooftops. The helicopter/plane option is great for large buildings and to include a wide context, as you are shooting from a higher vantage point. It is the most expensive option, but it’s also the easiest way to make sure you follow laws and regulations. Check out my previous article for tips on how to shoot from a helicopter. Drones are great for smaller buildings and locations outside of the city. It allows you to fly a low altitude and are very flexible, helping you get very specific angles. However, regulations can be tough, so make sure you’re following the law and not endangering anyone! Photofocus has many articles about drone photography. While most people wouldn’t consider rooftops as aerial photography, it can yield similar point of views. In downtown areas, it allows you to get mid-height images (like the one below) that show a different perspective. While the helicopter shot shows a map-like view, the shot from a rooftop will be closer to the action and be more relatable. The key to shoot from rooftops is access. Contact property management at the location and explain you’re a professional, shooting for a client. Also, keep in mind that balconies and terraces are good places to shoot from too. Property management might be more inclined to let you shoot from a safe balcony, to avoid liability. Once you’re in the air (or on your rooftop), what are you looking for? The most obvious image is the close-up, focusing on the building. It’s not always the most exciting, but it captures the building’s features. Capturing context is very important and one of the main goals of aerial photography. Think about the immediate context, as in the image below, where the tower is across the street from the Royal Ontario Museum. The wider context is important as well, so shoot from further away and includes the whole city. Having the skyline in the background also simulates the view that penthouse units have. When shooting a large residential property, an aerial view is a great way to capture the entire property and really showcase all the amenities. Finally, the straight-down shot can be a great tool to create a very graphic image. It also serves as a blueprint shot. 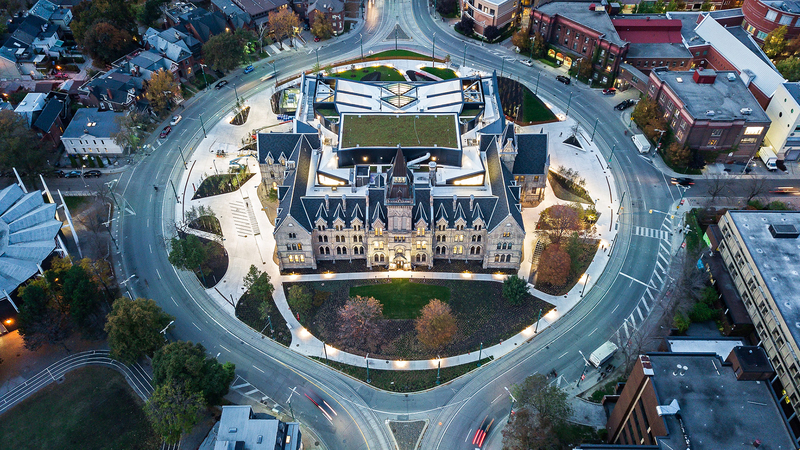 Aerials can be scary and expensive, but it’s well worth it for architectural photography! Talk to your clients and sell them on the benefits. Plus, it’s a lot of fun!